In case you're going to connect to a remote device with an Ethernet network connection that uses a specific TCP-Port for communication you can use the utility CNCScan.exe to ensure that the device can be reached and responds. Right of 'Host address' enter the IP Address of the device into the first field (start) (2). If you just test one device enter the same address into the field below (end). For one device you can also enter it's DNS-Hostname into these two fields. If you have more than one device you can enter a range of IP-Addresses here, e.g. 192.168.1.100 (start) 192.168.1.110 (end). Right of 'Port' (3) you can select either 'list' or 'range'. If you want to test one port select list and enter the port into the field right of it (e.g. 8193 = Fanuc Focas Standard). If you now click on 'Scan' (4) the program tries to contact the specified devices and get a reply from them, this may take some time depending on the number of devices. You can see the IP-Address and port of the device currently being scanned in the top bar of the program. 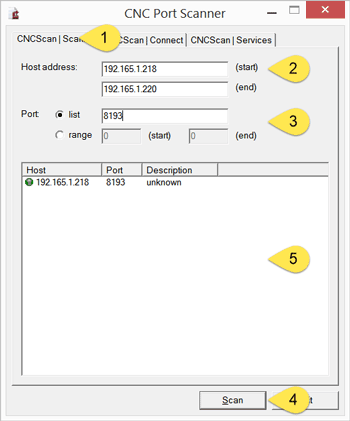 Tab 'CNCScan | Connect' can be used to test connectivity and exchange data with devices that use 'Windows Socket' communication. Right to 'Host address' you can enter the IP Address of the remote device and the port number that should be used. Clicking on 'Connect' tries to establish a connection. You can enter a command into the field below 'Send' and click on button 'Send'. If you get a reply you can see that in the field under 'Receive'. Tab 'CNCScan | Services' shows the services, ports and protocols known by your PC, on newer MS Windows Operating Systems most likely you need administrative privileges to see something. Note: To use the CNC Port Scanner on Windows XP you have to copy the files mfc120.dll, msvcp120.dll, msvcp120d.dll, msvcr120.dll and msvcr120d.dll into the folder with CNCScan.exe.